CINCINNATI, OHIO, UNITED STATES, October 29, 2018 /EINPresswire.com/ -- Cincinnati, USA, October 29, 2018, /EinPresswire.com/ -- Having a passion to explore the strength of technologies, Hemendra spends his most of the time in researching and learning about the current trends in the IT world. Being a CEO of a global mobile app and web development company, he is well aware of the fact that to earn client’s trust and offer top-notch services, it is important to be on toes to accept the latest trends and technologies in the dynamic IT sector. Hemendra has a way to play with the words to educate and help his fellow colleagues, entrepreneurs and technology evangelists. He writes mostly on software development tops and the technologies that are the driving force in today’s time. The topics he has covered since his journey as a writer are mobile app development technologies, web development technologies, trends, and technology updates in iOS app development, Android app development, and emerging app development (IoT, AR, VR, Beacon, Wearable, Cloud, etc.). He added, I always want to motivate my audience and my employees because they look upon to a leader who is wise enough to understand the demand of the market. Moreover, I want to share my knowledge which I have gained in my professional career with the new emerging entrepreneurs and startups. To help them learn about the best practices to run a business in a competitive environment. CustomerThink is a global platform that brings together business leader from all around the world. It provides a platform where business leaders can leverage the benefits to generate a customer-centric enterprise. Their mission is to help and motivate businesses to develop and incorporate the best strategies to drive high user-engagement. 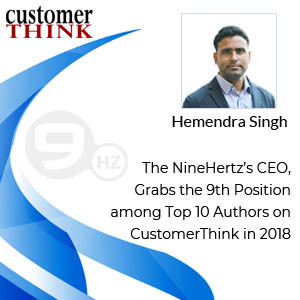 Being listed in the top 10 authors in 2018 adds another achievement to not only Hemendra Singh but also indicates that The NineHertz is becoming top Mobile Application Development and Web Development Company among the clients. Earlier this year, The NinHertz ranks among top mobile app development companies in USA and India by Business of Apps, thus the company surely working towards attaining excellence in mobile and web development. Hemendra took charge to reach out his audience more passionately and start writing knowledgeable articles and blogs. And thus, securing a position in top 10 authors in CustomerThink which is a global business leaders’ platform. 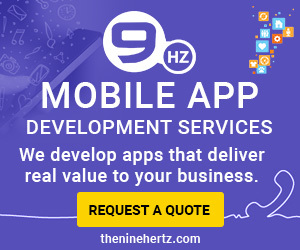 The NineHertz is a renowned name in developing highly functional and exclusive mobile app and web applications for its global clients. Since its inception, the company has gained trust and established a long-term relationship with their clients. The company aims to develop technology-driven applications and services. Offering best-suited solutions depending on the client’s demands and user perspective. The company was established in 2008 and in 10+ years it has delivered 1000+ projects to a diverse industrial domain. The industries they have served are Logistics, Healthcare, Real-Estate, Travel, Education, etc. The company offers a wide range of services like Mobile application development, Web development, IoT app development, iPhone app development, iOS app development, Cross-platform development, etc. The NineHertz is among the top leaders in mobile app development companies and web development companies, exploring various technical domain to satisfy their global clients.